StoSim is easy to get started with: By only writing one configuration file, your simulation is parameterised and jobs are distributed on available CPUs on your computer. When all jobs are done, paper-ready plots as well as T-tests are being created (see Setting up a basic simulation). All your code needs to do to work with StoSim is to read a set of parameters from a config file and write its output log into a file which StoSim provides. 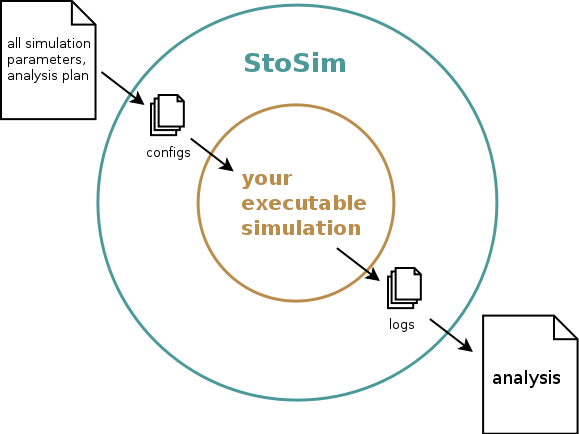 StoSim is developed under an open-source MIT license at the CWI Amsterdam and written in Python (but, I repeat, the simulation code can be written in any programming language). Find the code at github It makes use of open-source industry standards like Unix screens, PBS job schduling, rsync, Gnuplot and Gnu R. While it proves very useful for its current small userbase, there is still lots of things to do even better (see the Ticket tracker) and a lot of great ideas to go from here. Let me know if you have ideas or want to contribute. Please contact Nicolas Höning with any questions or problems. Which kind of simulations would I run with StoSim?